Welcome to the Virtual Potluck’s latest party! Our special guest for this party is Artisana, a company that creates raw and organic nut butters, as well as some delicious roasted butters and great coconut oils and butters. Preheat oven to 350F. Grease ramekins and set aside. Whisk together egg, milk, cashew butter, sugar, and salt. Toss bread crumbs with coffee grounds. Add baking powder. 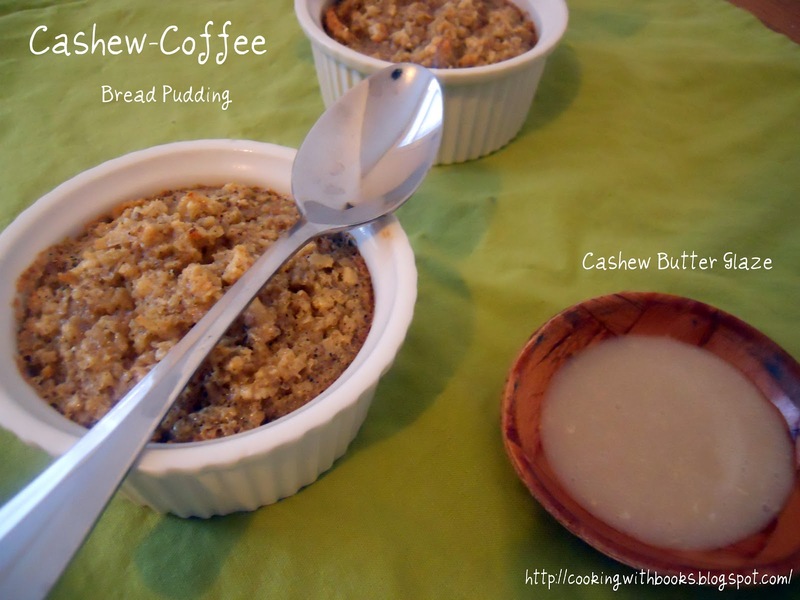 Add coffee bread crumbs to wet ingredients and absorb the custard for 5 minutes. Pour into ramekins and bake for 25-30 minutes. In the meantime, make glaze by whisking together cashew butter, water, and sugar. Serve while warm, and drizzle glaze over it. Serve a side of the glaze if needed! *Note: You can either add finely ground coffee to the bread crumbs, or do as I did and throw some bread chunks into your coffee grinder. Not only will you end up with coffee scented bread crumbs, but your coffee grinder will be clean! See this post on Facebook for the how-to picture. Would you love to try Artisana products in your own kitchen? Well you’re in luck, because each and every one of us is giving away one-8 ounce jar of their choice, plus various squeeze packets of different nut butters! • Visit the Artisana website and tell me the nut butter you’d love to try! The comments are the official entry, there is no purchase necessary, void where prohibited. US mailing addresses only. One (1) winner will be chosen randomly. Prize will be shipped by Artisana. The contest ends Sunday, May 6th, 2012 at 11:59 pm Eastern time. The winner will be announced on Monday, May 7th via email and will have 48 hours to respond before a new winner is chosen. Disclaimer: This post is sponsored by Artisana, and as always my opinions are based on personal recipe testing (an tasting!) No monetary compensation was exchanged. I’m following Cooking with books on Google Friend Connect. I follow Virtual Potluck and you on Twitter! I visited the site and the Cashew Butter looks great! I would like to try the Cashew Butter! I follow virtual potluck on twitter. 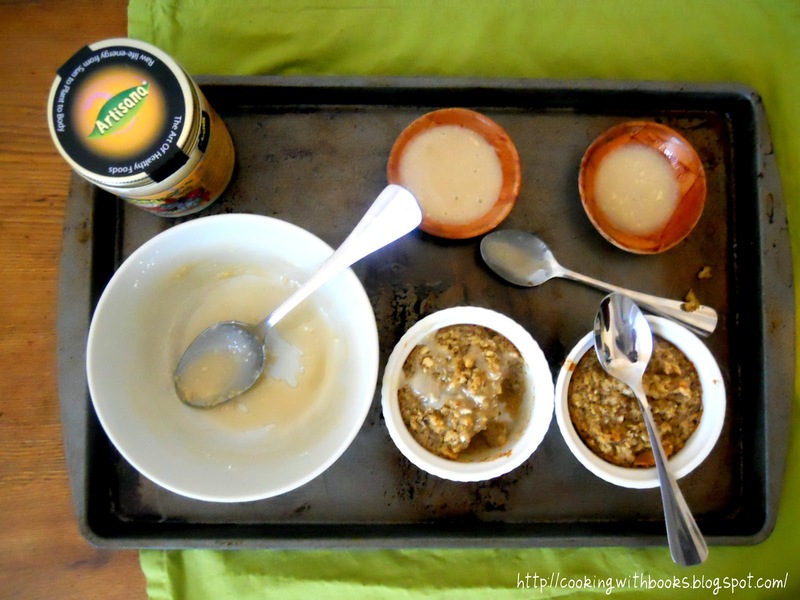 I would love to try the macadamia nut butter- holy yum!! I love bread pudding! This looks awesome. Following virtual potluck on twitter! Organic Raw Cacao Bliss and almond butter sound equally delicious to try out! Oooh–I love nut butters. I haven’t seen the walnut. I would love to try the walnut nutter. Awesome giveaway! I’d love to try the macademia-cashew butter or the coconut butter! ohgoodgolly cashews are my weakness so I definitely would love to try their Organic Raw Cashew Butter. the walnut butter – looks yummy. I follow Virtual Pot Luck on Twitter. I’d like to try the Raw Cacao Bliss! I follow VP on Twitter. I would love to try the coconut butter. Your bread pudding looks pretty darn good. I don’t drink coffee but I love the flavor. I have started using espresso powder in my brownies and cookies, oh what a difference it makes. The cashew butter would probably sit pretty well on my palate! Great products,thanks for putting it together! Your bread pudding looks amazing! Thanks for organizing this and great job on the bread pudding. Love your photos!